I’ve finally made it to another one of my dream bucket list destinations: Australia! I can’t believe I’ve finally made it! I’m in awe of everything I see and I can’t wait to explore more of the country. I’ve been enjoying sightseeing throughout Sydney and the surrounding area seeing all of the iconic sights! Stay tuned for posts about my journey traveling around Australia! This is the farthest I’ve ever flown and I am ecstatic. 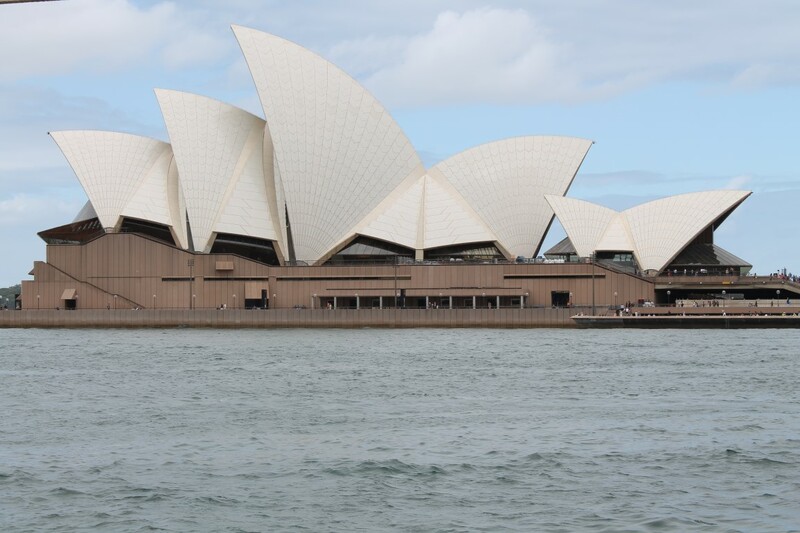 This entry was posted in Australia, Oceania, travel and tagged Australia, Bucket List, experiences, Opera Bar, Opera House, Sydney, Sydney Opera House, Travel, travel photography, Turquoise Compass by Turquoise Compass. Bookmark the permalink. YAY – First Australian post 🙂 It was great meeting you today! Whoooooooooooooo Whooooooooooooooooo You are amazing! So glad that we could connect! We should have got a picture together! I will definitely let you know if I am back in Sydney. I wish I could have met David. Here is the traveling with a carry on post I mentioned to you. Take a look and let me know what you think. So exciting! I am beyond amazed every moment! Than you so much! dropbears??? Now now now I will have to find out on my own? Well done! Enjoy and take tons of photos! I will for sure take lots of pics. You will get tired of them soon enough! Welcome to beautiful Australia. You must come to Melbourne too it is very beautiful. I will be coming to Melbourne in March! What do you recommend? Everything, the city is gorgeous, lots to see and do. Werribee zoo, Melbourne zoo, Healsville sanctuary. (Sorry animal lover naturally I love anything to do with animals lol). St. Kilda Esplanade. Auckland street, and heaps heaps more. Great suggestions! I can’t wait until I make it there. I hope you’ve considered staying at the international youth hostels. We stayed at the one in Sydney that used to be a train station. They are all conveniently located and you can find short term work through them too. Luckily I stayed with a friend of a friend in Sydney, but I will be staying in hostels along the Gold Coast and Queensland! Awesome! Thanks for the great tips! I will look into it! Nice for you to arrive to Australia. I’m looking forward to explore the country together with you by your blog. Enjoy Jessica. I can’t wait to share with you what I have been doing in Oz so far. I’ve done so much already in just a short amount of time. Where are you located now? I am loving it already and it gets better in each destination! Aww amazing! I was in Sydney, but I don’t know how close you are to that. Thank you so much! It has been incredible so far. I will take so many pictures all of my followers will get sick of me! So exciting! I am completely jealous and can’t wait to hear about your trip! I feel the same way about the destinations you visit! I am glad we can share our journey with each other. Thank you so much Lisa. I am happy to have you along for the journey! Hurrah! I’m so looking forward to reading more about your adventures Down Under LOL! Thank you so much! I am having fun down under.